My CSA box came with a butternut squash, and I had no desire to make soup...which it seems is the most popular recipe for butternut squash. It's fine, it's just not my thing. I started looking around for recipes online when I realized I could just substitute out the squash for the veggies in my go-to vegan mac n cheese recipe. For the record, I hate when people don't give you specific amounts and say a small/medium/large whatever. In this case, I have no choice because 1. I didn't measure it 2. It's not that serious, just wing it, it'll be fine. Peel and cube a butternut squash. Put squash, onions and garlic on a baking tray with a silpat or parchment liner. Coat lightly with olive oil (or whatever oil you like). Put the tray on the middle shelf of the oven and bake for approximately a half hour. Flip everything around half way through. Now that you're waiting on things to bake and boil, put everything from the last set of ingredients (cashews down to the paprika) into blender. And...wait. Carefully blend everything. Drain your pasta (assuming it's done) and put it back in the pot. Pour in the peas and mix it up. Take your veggies out of the oven (also assuming it's done) and dump everything into the blender. Blend again until everything is creamy and super smooth. Now pour this mix in with the pasta and give it a stir. 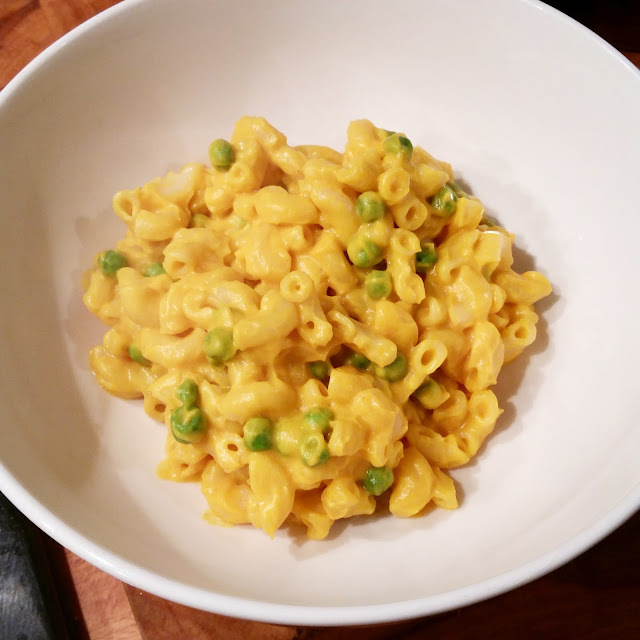 Thanks for sharing the recipe of Vegan Butternut Squash Mac n Cheese.I am thinking to make it today for my children.They would definitely love it for sure.